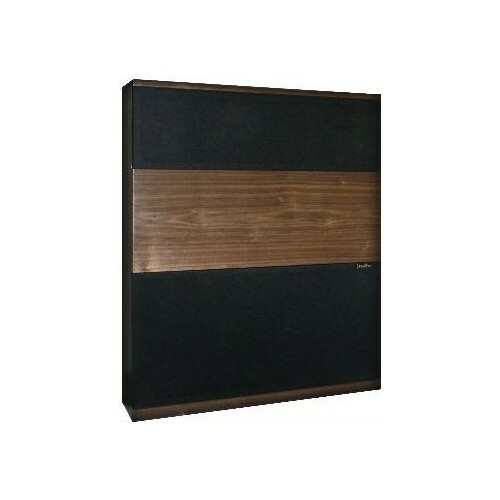 High efficiency loudspeaker corner reproducer Lowther TP1 "Imperator"
INTRODUCING THE INCOMPARABLE TP1 "IMPERATOR"
The TP1 speaker uses just one Lowther EX4 high-flux drive unit, made to Lowther's own exclusive design. The drive unit is mounted between expanding columns of air, activated within two acoustically balanced exponential horns - this loudspeaker fulfils the demands of ideal criteria. Together, these two horns reproduce the audio spectrum exactly as required for perfect listening. They control movement of the drive unit's twin cone diaphragm assembly, keeping it's travel as short as possible and contained well within the powerful magnetic field at all frequencies, thus reducing possible distortion at source to an absolute minimum. An acoustic volumetric capacitance of critical proportions is positioned between the drive unit and commencement of the bass horn, causing the unit to behave as a compression driver. This horn is a remarkable 4.5 metre (14' 10") long. This well-known ideal dimension eliminates the possibility of standing waves developing from reflected sound waves inside. This allows the bass horn response to be smooth, natural and free from distortion right throughout the lower audible range in a way unequalled by other speaker systems. The TP1 system is completed by the forward horn section, which is meticulously balanced to reproduce mid-range and top frequencies with outstanding clarity and living realism. Employing just one super efficient full range drive unit, electronic crossovers are dispensed with, quality of performance is enhanced and reproduced sound becomes unimpaired, transparently clear and of such purity that every detail is in its true audio perspective at all levels of volume. It gives an awareness of realism and liveliness almost beyond belief. Lowther TP1 loudspeakers are designed to be positioned in room-corners and are, accordingly, triangular in section. Distance between speakers is not critical, nor are listeners obliged to remain confined to a narrow central area of the room in order to obtain excellent stereo imaging.